Warren told reporters she did not have exact information about the status or number of people being detained at Logan. “I cannot believe this is happening,” she said. 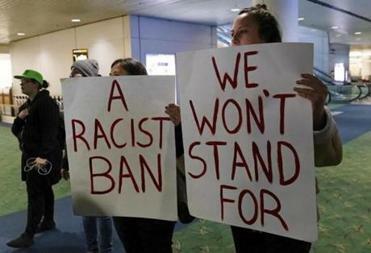 Around the country, people protested Trump’s order at airports. The executive order, signed on Friday, bars all refugees from entering the country for 120 days and Syrian refugees indefinitely. The temporary ban also applied to immigrants from Iran, Iraq, Libya, Somalia, Sudan, Syria and Yemen. Thousands gathered at major airports across the US to voice their displeasure with the executive order.